Stands announced today that its Embracelet now has a new charm. 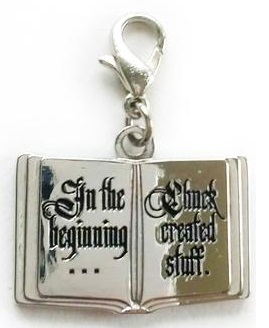 The Rob Benedict charm, “The Winchester Gospels,” is a replica of a miniature book that tells the story of creation. Stands has also released three other items! A “Funnier in Enochian” charm, a “Heaven’s Portal” charm, and a “What Would the Winchesters Do?” t-shirt are all available for purchase. Benedict’s limited edition charm can be purchased on Stands’ website here, and the Embracelet itself is available year-round for $20. A portion of proceeds from the sales of the Chuck Charm will benefit the National Stroke Association.